Posted on Wed, May 19, 2010 : 1:56 p.m.
CHICAGO - Michigan athletic director Dave Brandon said Wednesday that the Wolverines and Irish never signed the 20-year contract they agreed to three years ago. The extension, which is still in the works, will continue the storied football rivalry into the 2030s. 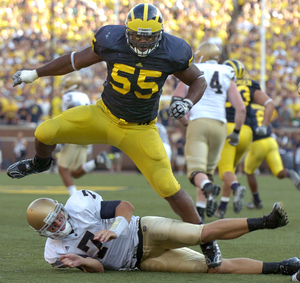 Michigan's Brandon Graham stomps over Notre Dame quarterback Jimmy Clausen after knocking him to the Michigan Stadium turf during third quarter action of the Wolverine's 38-34 win over Notre Dame, Saturday, September 12th at Michigan Stadium . “We don’t really have a contract right now,” Brandon said at the Big Ten spring meetings. “We announced that we had kind of reached a meeting of the minds for a 20-year extension with the potential of a two-year hiatus, but that was never codified into a contract. In March, Michigan announced it would host its first-ever night game against Notre Dame in 2011 and its series with the Irish would continue through 2017, with a two-year break to play a home-and-home series with another school. The rivalry would resume in 2020, the press release said. In 2007, Michigan and Notre Dame jointly announced a 20-year extension to play every season through 2031. Brandon was asked Wednesday what his intentions were with the unsigned contract. “To work with Jack (Swarbrick), the athletic director at Notre Dame, and hammer out something that’s good for both schools,” he said. "He’s new and I’m new from where that 20-year announcement was made so we’ll just have to kind of pick that up, and when we have something to share publicly we’ll share it." Of course, the issue of continuing the Michigan-Notre Dame series could be moot if the Irish decide to join the Big Ten. Commissioner Jim Delany said no decision on conference expansion is expected until this fall at the earliest. “I don’t agree with that, that that’s going to accomplish anything,” he said. Sun, Jun 6, 2010 : 12:24 p.m.
Tater would make Saddam's former disinformation minister proud. ND has had a contract w/NBC since '91, before BCS existed. Initially a 5yr contract for 38 Mil, it's renewed every 5 yrs and avg's $1.2 Mil per game, around $9 Mil per yr. Another commentor said Big 10 teams make more than ND's contract, so it would be better for ND to join. How much better? Tell everyone how much more Big Ten is offering ND. Are there any strings attached? Forbes reports ND has returned more than $21 Mil to its academics, more than the next 5 programs combined. Would the strings jeopardize that? UM conveniently forgets the history; ND asked to join the Big Ten in the early 1900's, but UM put their foot downing saying a small Catholic school has no place in the Big Ten. Old ND alums hv never forgotten that snub by one school in particular. Probably UM had still not forgiven ND for costing them an undefeated 1909 season, to add insult to injury, UM then refused to play ND for 67 of next 69 yrs. Under Frank Leahy, ND beat #2 UM in '43, then Leahy vowed never to play another team fm the state of Michigan, not while he was there; he was tired of the trashtalk and anti-Catholic garbage. There was a lot of hate against Catholics in the 20th century; the KKK used to come down fm Michigan and stir up trouble in S.Bend. So while the ND faculty voted to join the conf in '99, old ND alums hv long memories, some still hv crooked noses fm the fights w/the anti-Catholics. UNTIL those alums start passing away, and UNLESS it makes sense financially, ND won't give up the $1.2 Mil per game NBC has been offering for 20 yrs. It's math &amp; history, boys. Know your history, and you'll know why old ND alums resent UM always making ND out as the bad guy -- history shows otherwise. And those old alums remember b/c they lived it. BTW, Brandon is same former CEO of Domino's who backed out of the 30-min guarantee in '93 but still kept the slogan, "You got 30 Minutes." You believe everything he says? Maybe UM is under orders NOT to sign with ND unless they join Big Ten, that kinda makes sense. The Conf made an ultimatum today to Nebraska &amp; Missouri.. And Big Ten teams won't boycott ND; when teams play at S.Bend on NBC, they get their share of the NBC largesse. Money talks, BS walks. They don't teach that at UM anymore? Reading all these forum comments, I hv to ask why UM fanboys don't want to play recognized teams on the road? I don't mean Slippery Rock, I mean names people recognize. It used to be Anytime, Anywhere, Baby. Now it's, "Gee, it would be nice to play UT or ND every other year... at home, but NOT every frickin year, and NOT on the road." UM and the Big Ten hv to recognize they created the bad blood against ND in the prev century, and continue to perpetuate it still today with nonsense fm its fanboys, as seen on this forum. Part of getting a deal with ND will hv to involve admitting history, or Big Ten will just hv to wait for all the old alums to pass away. Fri, May 21, 2010 : 3:52 p.m. Okay, maybe I wasn't being clear in my last post, so let me try again. Care to provide some factual basis for your statement? Calling everything a joke is not only invalid but also not a fact. Fri, May 21, 2010 : 11:38 a.m.
As an institution, UM has made one very bad move for which they got a free pass. Rather than honor a legitimate contract, they tried to save a few bucks by not paying the RR WV buyout. In doing so, they dragged the UM name through the mud like it had never been dragged before. I'm still in shock that they thought they could get away with it. Settling for the full amount only solidifies the fact that they knew they were in the wrong. Thu, May 20, 2010 : 11:17 a.m.
redceder1, joke? Based on what? Care to provide some factual basis for your statement? I'll wait. Thu, May 20, 2010 : 8:58 a.m.
Ah, the Sparty perspective! Don't you have a bunch of players due in court? Worry about your own mess! Wed, May 19, 2010 : 9:49 p.m.
WOW, can you belive anything that comes out of UM? I'm sure we will see something like Ball state. Wed, May 19, 2010 : 8:40 p.m. Sounds to me like rr is trying to weasel his way out of something else. Hey Brandon, show some class and honor thy contract. Go Blue!!!! Hopefully, we'll get em next year. Wed, May 19, 2010 : 8:09 p.m. Honor down the crapper??? What do you call bad mouthing ND constantly and then begging every few years for them to join the Big Ten. Real Honorable!!!! ND isn't houlier than thou. They just graduate 95% of their football players.......on bad years. When UM cracks 60% let me know. Wed, May 19, 2010 : 8:02 p.m.
Yeah, pay a fortune for tickets and maybe get to see Slippery Rock or Appalachian St. I know they won't schedule Toledo again! What happened to "we'll strap it on and play anyone, anytime, anywhere? Martin was probably in the Caribean on his sail boat! Leaders and Best? Once Upon A Time! Wed, May 19, 2010 : 7:35 p.m. Wed, May 19, 2010 : 3:29 p.m. I agree with Blue Market--Michigan should take this as an opportunity to become more creative with the non-conference scheduling. Like the vast majority of major BCS programs, Michigan only schedules one major non-conference opponent per year. I don't have a problem with a couple of MAC teams on the non-conference schedule to go along with a third buy-in game--that's been the pattern for awhile. There's no strong reason for Michigan to play Notre Dame as its major non-conference opponent every season. There are some pros to doing this--its a natural rivalry game that can be easily promoted, Michigan keeps all the home gate, travel costs are low, the game consistently gets good ratings, etc. But there are a dozen other programs out there with instant name recognition that will also get high ratings, are likely to be in major recruiting areas, etc. in the ACC (Virginia Tech, Miami-FL, Florida State), Big XII (Nebraska, Oklahoma, Texas) and SEC (Alabama, Auburn, Florida, Georgia, Louisiana State, Tennessee). Michigan has played many of these programs in bowl games, but rarely during the regular season with one exception. I'd like to see match ups with these programs along with Notre Dame as part of a mix--maybe with UM playing ND twice every six to eight years. As a Michigan fan and alum, I'd love to see the Wolverines play in Tuscaloosa or Austin or Gainesvile and not be sent to South Bend every other year. On a final note, I attended the Michigan-Texas Rose Bowl game nearly five years ago. Despite the final score, it was a great game against a name program that Michigan had never played before. The Texas fans were great and the whole experience was new and unique. I'd certainly like to see something like that happen again in the regular season--Texas at Michigan in Michigan Stadium some future September would be a great idea. Wed, May 19, 2010 : 3:14 p.m. Wed, May 19, 2010 : 2:49 p.m.
Couldn't have come at a better time. I come from the business world, and I have to say that this is a Fortune 500, CEO move on Dave Brandon's part.. Think about it......Here's a 20 year, multi-million dollar bargaining chip that's just been played masterfully by our AD.. A word of advise to the uninitiated: never play chess against Dave Brandon! Wed, May 19, 2010 : 2:39 p.m.
@ Tater: There was no BCS when Notre Dame signed up with NBC. Wed, May 19, 2010 : 2:34 p.m.
We can't beat them if we don't play them. Sign the contract! Wed, May 19, 2010 : 2:21 p.m. I can't imagine this is an accident. Looks more like leaving a little leverage to me. Why sign if they will join the Big Ten and if they don't want to, well, then, you're not tied into an annoying contract. Wed, May 19, 2010 : 2:15 p.m. I would love to see UM skip the ND game!...Assuming we fill in with a marquee opponent. Maybe we play ND home and home, then a top program from the SEC, Pac 10, Big 12, etc...then back to ND. That way we get some variety, but we still get to whip the hated, irrelevent Irish once and a while. Sounds like a plan to me. Wed, May 19, 2010 : 2:11 p.m. I agree with Tater and Lokalisier. Wed, May 19, 2010 : 2:03 p.m.
Agree with Tater...you don't want to be in the Big 10? Then you don't have to play our teams. Michiagn can replace that game with actual decent new teams. Wed, May 19, 2010 : 1:34 p.m.
You wonder if someone simply revisited the official documents and realized one party (or both?) neglected to actually sign. Wed, May 19, 2010 : 1:28 p.m.
No signed contract after announcing a formal agreement in 2007. It's another inadequacy in Bill Martin's performance during his closing years as AD. Maybe he forgot to "push" his way through. Wed, May 19, 2010 : 1:20 p.m. Excellent! Now can we be a bit more creative in scheduling? If I have to pay $50.00 a ticket to see UMass than give me some variety for the "big" Non-conference game.